Good Luck! If you want to start an animated discussion at a disability community event, all you need to do is bring up the issue of Disabled Parking Placard abuse. In urban corridors one might think that people with disabilities have reached full-employment based on the number of cars parked at city meters all day, but truth be told our employment rate is just 34%. Sadly, an overwhelming number of people using Disabled Parking Placards are able-bodied people who are avoiding the cost of parking by pretending to be disabled. They are “borrowing” placards, they are stealing placards, they are buying placards, and they are lying to get placards. Able-bodied placard abusers not only steal parking places from people with disabilities, they steal our ability to participate in society. What makes a placard valuable? Accessible parking spaces are remarkable in that they offer a variety of advantages for a diverse community of people with disabilities. Blue painted spaces exist because the regular spaces won’t work for people with disabilities. Accessible spaces make it possible to use assistive devices such as wheelchairs and walkers that require room on the sides and/or rear of the vehicle in order to exit and enter. The placement of accessible spaces close to entrances makes it possible for people who find it difficult to walk or breathe for even short distances to be function independently. Parking for an unlimited amount of time at no cost is a consequence of inaccessible parking meters, and barriers to accessing parking meters. Assistive device users often cannot get close enough to a meter to either read it or feed it. What makes a disability placard valuable to people with disabilities is the freedom, independence, and equality it affords. Who is harmed by placard abuse? People with disabilities, their family members and caregivers experience a lack of accessible parking almost everywhere we go. Businesses suffer from the lack of parking turnover and lose sales as a result. Auto insurance companies are paying claims driven by the under-ground placard trade. Cities lose meter revenue that could otherwise be used to provide increased city services to everyone. We all lose! No new news here - we have a broken system! Whether we like it or not, the fact that placard users are not required to pay for parking has incentivized widespread fraud and abuse, making it extremely difficult for legitimate placard users to park while at the same time busting city budgets. What fixes have been tried? Some cities have tried resolving the upside-down incentive by requiring placard users to pay for parking, essentially making people with disabilities pay for the sins of the able-bodied abusers. Cities have implemented a variety of strategies to mitigate the impact on disabled placard users which have included allowing us to pay for time beyond the designated limit, or by adding metered spaces reserved for specifically for people with disabilities. Similar to many disability access laws the lack of enforcement has achieved limited accessibility. Some states have tried to combat abuse by making it more difficult to obtain a placard, increasing enforcement initiatives and/or imposing stiffer penalties. Others have allowed individual municipalities the option to end free parking. There are states that now require placards to display a photo of the user, others are using bar codes, or providing law enforcement quick access to information about the placard user to aid in verifying the legitimate user from an abuser. One state provides no-cost parking only to individuals with physical disabilities that make it impossible to either approach or feed a parking meter. Some colleges and cities provide the option to pay for parking using a smart phone application or personal hand held parking meter. Let's be honest, solutions resolving fraud and abuse are being driven by cities’ need to capture parking revenue, not the need for accessible parking for people with disabilities. This is important to state because the population of people with disabilities is growing as a result of improvements in access throughout society, improvements in health care, and baby boomers living longer and aging into disability. If we really intend to resolve placard abuse it can’t just be about parking meters and revenue. While eliminating free parking may help cut down on meter fraud, it will not resolve the larger issue of parking placard fraud that occurs everywhere else--in free non-metered parking lots and city streets. Over the last five years, CFILC has been asked by the legislature to provide policy guidance regarding parking placard abuse. We have consistently opposed efforts that would diminish accessibility and increase costs for people with disabilities. We have often been asked to speak with authority on the experiences of placard users, yet we knew of no data that directly sought the experiences of placard users. In an effort to better understand the actual experiences of placard users CFILC conducted a statewide electronic survey in the Spring of 2015. We distributed an 11 question non-scientific “Survey Monkey” via email to over 4000 individuals and organizations. We asked participants about their experiences finding accessible parking, their use of parking meter spaces, and individual preferences when looking for on-street parking. We offered the survey in English, Spanish and Chinese. We received a total of 548 responses, 98% of which were in English. While respondents were primarily concentrated in the in the Bay Area, the Los Angeles metropolitan region and other large urban areas, the results included representation from less dense areas in central and northern California as well. Survey respondents were nearly evenly split among those who typically park in areas with parking meters and those who do not. The survey provides useful data to evaluate accessible parking preferences, including what placard users value when finding and using metered parking in their daily lives. Survey Findings: Finding parking in areas with meters is a problem. often have difficulty finding parking. It should not be surprising that our survey identified that the current system of disabled parking placards is not working as it is intended. People who use placards rely on them to park as close to their destinations as possible, yet the majority of survey respondents (65 percent) often or sometimes have difficulty finding a parking space when parking in areas with metered parking. It’s even worse for people who typically park in areas with meters, 72 percent often or sometimes have difficulty finding a metered parking space. 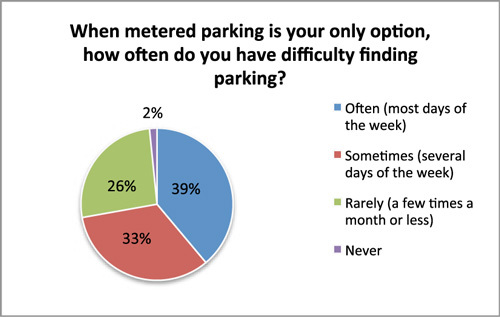 Only 9% of respondents report never having a problem finding parking in metered areas and 40% have difficulty parking most days of the week. This data (shown in Figure 1) suggests that parking space availability is an issue for most people with disabilities who use placards. Parking near destination is most important for people with disabilities. The survey results show a strong preference for parking near where placard users are going. Over two-thirds (67 percent) of respondents expressed a preference for parking wherever is closest to their destination as opposed to seeking out a specially designated blue curb zone. Of particular note is the data which shows that people who park in areas with parking meters, a spot closest to their destination takes priority over parking at a blue curb space. 77 percent of people who park in metered spaces said that they prefer to park wherever is closest regardless of whether or not it is a designated blue curb zone. Parking for an unlimited amount of time is important, but not used frequently. Disabled placards and plates allow users to park without any time restrictions, however survey results suggests that many users do not use metered parking for extended periods of time. Over 50 percent of all respondents stated that they rarely or never use more than the set time limit on metered spaces. Only 34% of respondents park in a metered parking space for longer than the time limit with any frequency. Free parking is least important, access is four times more important. A disabled parking placard allows a person to park at an accessible blue curb zone or at a metered parking space for free. 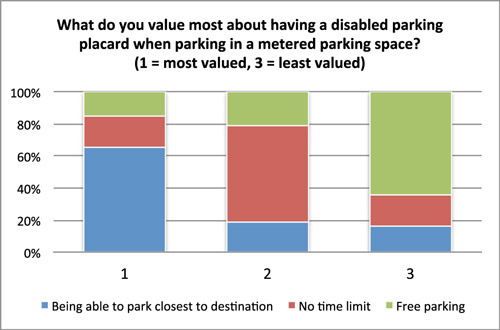 When survey participants were asked to rank what they value most about having a disabled parking placard when parking in a metered space, 65 percent of respondents ranked “being able to park closest to my destination” as most valued and 20 percent ranked “no time limit” as most valued, and 15 percent ranked “free parking” as the most valued benefit. Figure 2 depicts the rankings by percent of respondents. It is important to note that we purposefully asked questions that required respondents to value the privileges associated with placards. We acknowledge that rank value is not an accurate measure of the importance of placard privileges because respondents cannot give the same rating to multiple items, even if they are of equal importance to them. We acknowledge that this survey was neither scientific nor flawless. Therefore we caution government and elected officials who may be tempted to interpret the value of one privilege over another, as a mandate to eliminate the lesser valued privileges. All advantages that accompany a parking placard are valuable to our community, and make it possible for us to live, learn, work, play, shop and vote in society. We encourage disability organizations to consider developing future surveys to gain additional useful insights. This survey focused on how people use and value their disabled parking placards. It did not ask about trade-offs that respondents would be willing to accept in order to have a system that works better. The most powerful finding indicates that a lack of parking space availability is an issue for most placard users. CFILC is issuing a challenge that lays the cost of solving placard abuse on those who are abusing the system, not on legitimate placard users. 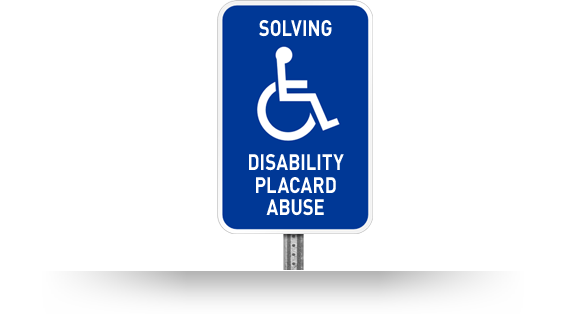 Solving placard abuse is likely to require a multipronged approach that includes effective enforcement, increased penalties and stricter placard eligibility standards for users and those charged with designating users. It will require an active and constructive dialogue among disabled placard users and representatives from state and local governments, elected officials and the technology sector. Be a catalyst for innovations in technology to solve placard fraud and abuse. The answer is in technology! We need a disruption in thought; we need to seek solutions using innovations through technology. We need to shred the plastic blue placards that were a good solution 25 years ago, but no longer serve us well. Transportation transformations are happening all around us, from self-driving cars to Smart-phone GPS, to Application based car services. CFILC invites thought leaders in the technology sector to consider solutions that use technology to capture revenue for cities, eliminates placard fraud and abuse, while maintaining no-cost, time unlimited accessible parking for people with disabilities across all parking venues. In order to gain traction in the technology sector there needs to be an investment of capitol and new thinking. Therefore CFILC is encouraging organizations to answer the 2015 Disability Google Impact Challenge “open call for solutions” to solve disability parking placard abuse. Google has invited us all to aim our collective might at creating a world that works for everyone. CFILC agrees that through innovation and everyday efforts, we can all help create more access and opportunity for people with disabilities. To solve parking placard abuse we need to be working closely with teams of innovators, technologists, people with disabilities, as well as state and local officials to develop a solution. Google is asking nonprofit innovators and problemsolvers to propose new ideas that will accelerate innovation to impact the lives of people with disabilities; this is our opportunity to answer their call by proposing ideas or assembly a team to submit a proposal to resolve disability parking placard abuse through technology. The deadline is September 30, 2015, to learn more go to https://google.org/impactchallenge/disabilities/. CFILC thanks the Independent Living Resource Center San Francisco and the San Francisco Municipal Transportation Agency for their generous in-kind technical assistance with the development of this survey.